The dimming lights of the Charles Bailey Theatre hush the sell-out crowd… but only for the briefest of moments. Onto the stage walk the aging Gordon Lightfoot band, all masters at their trade, and the crowd erupts with applause and cheers. These men, Gordon’s long time backup players, quickly step to their marks, while the audience waits a timeless moment for the Canadian folk music hero to enter the spotlight. No one knows what to expect from the aged troubadour, if he can still play and sing, yet few care. To merely spend an evening with the legend is enough. We wonder, as we wait in the dark, if there is a doctor in the house… just in case. Then from shadows of stage right a gaunt, hollow man with thin, gray locks ambles into the light. Time has replaced the once hale, deep-chested musician whose career has spanned six decades with a thin, frail senior in a red velvet dinner jacket. The crowd erupts. The man hefts his twelve-string, slings it over his shoulder and steps up to the microphone. “My glass may be nearly empty, but the rumors of my demise have been greatly exaggerated,” he laughs in a soft, gravely voice. And thus began another show for Gordon Lightfoot. Yet it was no ordinary show. 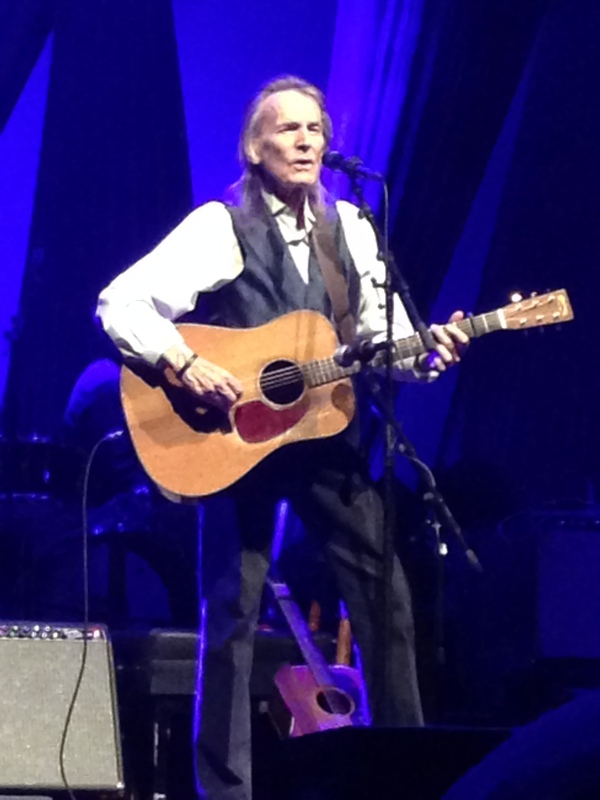 I have had the good fortune to see him play twice when we were much younger, and October 31st, 2014, in Trail, B.C. was no ordinary night. While his voice is no longer robust, it remains as smooth as fine Pendleton Whiskey, and his thin fingers still dance along his twelve-string guitar with an easy grace. Instead of performing an ordinary selection of hit songs, Gordon carefully selected a song cycle that told the story of his long relationship with and deep appreciation for his fans, without whose support he was nothing. He did not play what he thought we wanted to hear, rather he played what story he wanted to tell us. He was saying ‘thank you,’ and for many of us who may never be afforded another opportunity to watch him play, he was saying ‘goodbye’ in a most genuine and heartfelt fashion. He played two long sets and the show, including the intermission, was a solid two hours. His autumn Canadian tour includes a grueling twenty-four concerts in thirty-nine days, and that does not include any additional dates he plays American venues. It is an incredible feat and I feel blessed to have been a part of it, so close I could nearly reach out and shake his hand. When it was finally over, he returned to the stage for one final bow, giving everyone the thumbs up. His glass is not empty yet, and as exhausted as he is, he plans on enjoying every last drop. October, 2013, Isle Of Wight. Level 42’s Mark King is one of the music world’s hardest working chaps. While Level 42 faded from America’s short-term memory at the close of the 1980s, Mark King, Mike Lindup, and crew were just hitting their stride as musicians. Over the last two decades they have treated their fans to a seemingly never-ending tap of fresh music and intimate, small venue shows. While Americans were off subjecting themselves to the likes of The Boyz in the Sync, Justin Spears, Notorious Two-Bits, and other auto-tuned corporate-formula performers we are inexplicably ga-ga over, the men of Level 42 quietly, out of the spotlight, produced more than ten studio albums and solo projects. Their latest release, Sirens, a six track EP coming in at just over forty minutes, brings Level 42 full circle with a return to the jazz-funk sound that launched their career back in 1980. Whether listening to the title track, Sirens, Mike Lindup’s velvet vocals on My Independence Day, or the infectious Build Myself a Rocket (Mark’s daughter, the very talented Marlee King, does the backing vocals on this one), the only thought that comes to my mind is this – after 33 years, Level 42 remains true to the music.